The medical field would not be complete without the dedicated service of Nurse Anesthetists. These individuals provide a wonderful service to the medical facilities in which they work and the patients in which they provide services. The path to become a CRNA (Certified Registered Nurse Anesthetist) is not always easy but well worth the hard work and dedication to receive an education. Those who want to become Nurse Anesthetists should begin by receiving a Bachelor of Science in Nursing (BSN) before pursing the graduate level degree. It takes approximately 4 years to receive a bachelor’s degree in nursing. Students may also pursue their associate’s degree or diploma in nursing before receiving the bachelor’s degree. After working as a nurse for a few years, they can sit for the exam to become Registered Nurses. The NCLEX-RN exam is the exam needed to become an RN. After completing the above requirements, nurses must find an accredited nursing program to begin their master’s degree. They must hold a valid RN license before starting the program. The Master’s of Nursing (MSN) degree is the degree that Nurse Anesthetists pursue. The program may take anywhere from 24 to 36 months to complete. Before sitting for the national licensing exam, nurses must have a minimum of 12 months of experience working in a critical or acute care facility. They must complete the national certification exam to finalize the process. Nurses take the Certified Registered Nurse Anesthetist Exam to become CRNAs. Nurses must also complete continuing education hours to maintain their CRNA licensing. Most states require that CRNAs complete these hours every two years. Where Do CRNAs Nurse Anesthetists Work? Due to the specialized skills that Certified Registered Nurse Anesthetists have, they can work in a number of settings. A few of the work environments may include critical care floors, hospital operating rooms, outpatient centers, plastic surgeons’ offices, dentists’ offices, intensive care floors, labor and delivery units, management, podiatrists’ offices, and pain management clinics. CRNAs are so valuable because they provide the same level of care as anesthesiologists do. Medical facilities prefer to hire CRNAs because they are more cost-efficient and their level of skill is superior. Certified Registered Nurse Anesthetists also provide their care in government medical and military facilities. In many cases, CRNAs are the only individuals who provide anesthesia care in these environments. Some CRNAs work for private contracting firms providing anesthesia services. In some cases, these environments may offer salaries that are more lucrative and more job independence that working in other environments. Since CRNAs are so highly skilled, many of them choose to work independently in various work environments. They have a greater amount of independence than they would if they worked for a specific organization. They can also make lucrative salaries since they determine their fees for their anesthesia services. Many choose to work for an organization and work independently as Certified Registered Nurse Anesthetists. CRNAs do not leave their patients during the surgical procedures. They remain with their patients throughout the entire process, constantly monitoring to ensure that essential body functions are taking place. They may also modify the patient’s anesthetics throughout the procedure to make sure that the patient remains comfortable and safe. 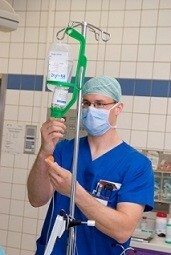 Some CRNAs work alone and others work in conjunction with a team headed by an anesthesiologist. No matter what the condition, CRNAs must work closely with other healthcare professionals to make sure the patient has the best experience possible. Possible members of the healthcare team may include dentists, other nurses, podiatrists, surgeons, and anesthesiologists. Certified Registered Nurse Anesthetists are highly skilled medical professionals who provide anesthetic care during medical procedures. They receive a graduate level education in addition to their undergraduate degree in nursing. They can work in a variety of work environments, and many choose to work independently providing anesthetic care. The medical profession would not be what it is today if it were not for the skills of CRNAs.